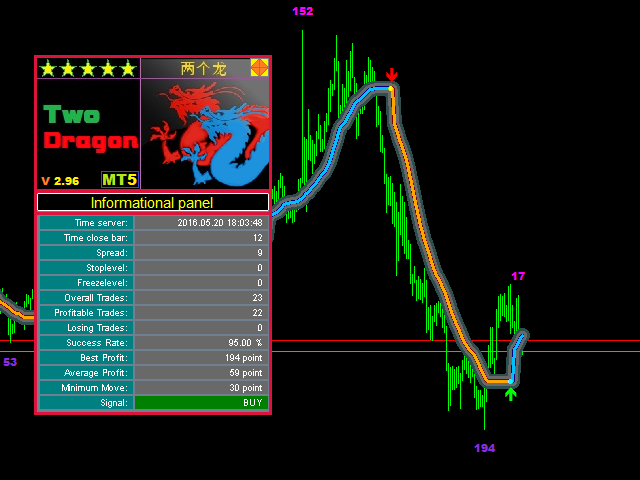 Two Dragon is an advanced indicator for identifying trends, which uses complex mathematical algorithms. It works in any timeframe and symbol. Indicator is designed with the possibility to customize all the parameters according to your requirements. Any feature can be enabled or disabled. 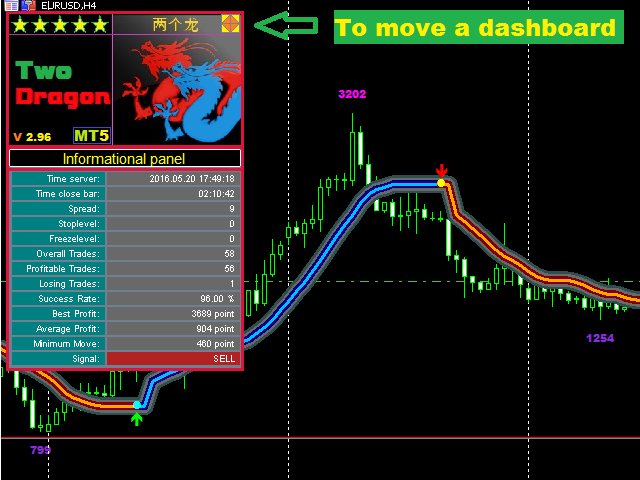 When a Buy / Sell trend changes the indicator will notify using notification: Alert, Sound signal, Email, Push. Product reviews are welcome. We hope you will find it useful. Max_Bars_History — Maximum bars in history. Select_Lines — Select the number of lines (1, 2). Size_Tunnel — The distances between lines. Color_Line_wide_1 — Color of the wide line 1. Color_Line_wide_2 — Color of the wide line 2. 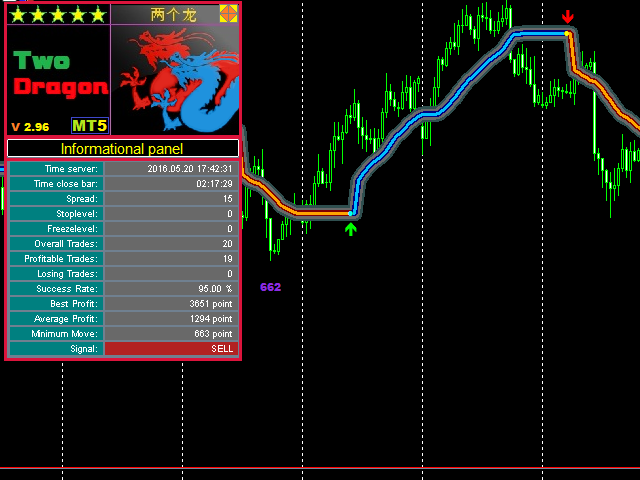 Color_Line_Average_Buy — Color of the middle Buy line. 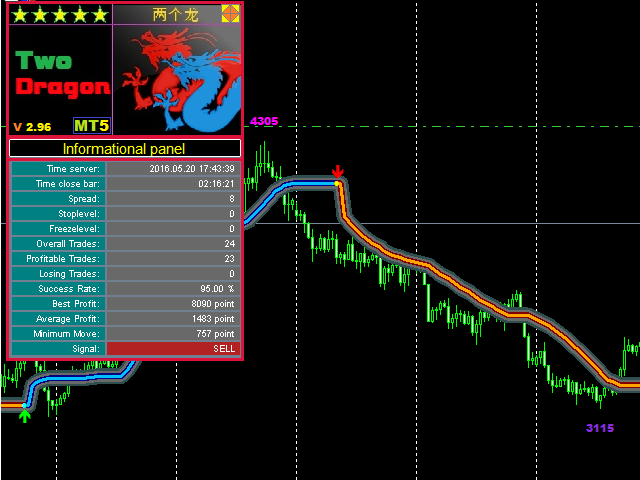 Color_Line_Average_Sell — Color of the middle Sell line. Color_Line_Thin_Buy — Color of the inner Buy line. Color_Line_Thin_Sell — Color of the inner Sell line. Color_Line_Circle_Buy — Color of the Buy line circle. Color_Line_Circle_Sell — Color of the Sell line circle. Color_Arrow_Buy — Color of the Buy arrow. 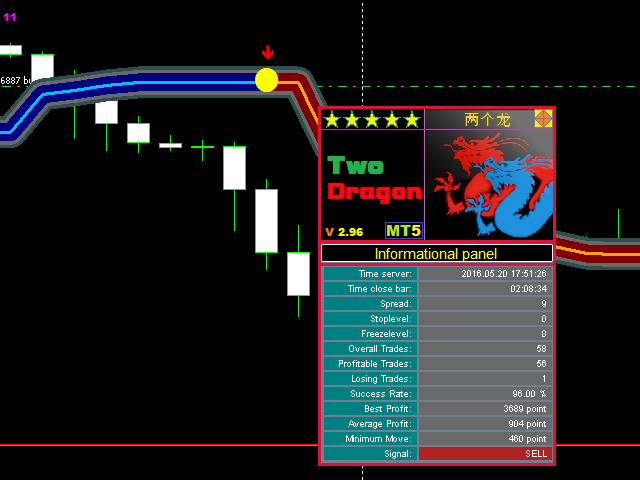 Color_Arrow_Sell — Color of the Sell arrow. Enable_Text_Profit_Point — Enable profit text. Color_Text_Profit_Point_Buy— Color of the profit text. Color_Text_Profit_Point_Sell— Color of the profit text. Enable_Show_Info_Panel — Enable the information panel. Sound_signal — Enable the audio signal. Name_sound_signal — Signal audio file name. Email_signal — Enable email notifications. PUSH_signal — Enable push notifications. 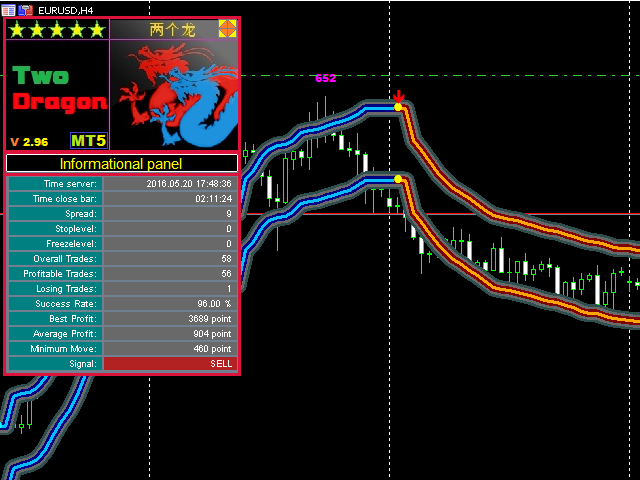 Added the ability to use multiple indicators on one chart. When attaching the second or more indicators, change the "Name_indicator" parameter. 1. Fixed slow testing error. Now testing is performed fast in the strategy tester.